Out of Print is a company that makes t-shirts, sweatshirts, and accessories with "out of print" classic books on them. What a neat concept! If you look over the shirts that they have, you will probably recognize almost every one of them. In fact, I have probably read about 7 of them when I was in school. The company says that with the way that the world is changing, the role of the book cover is unknown and they think that it is important to put the literary art on a shirt! 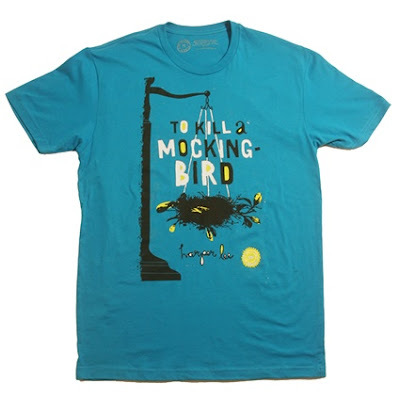 For my review, I was sent the To Kill a Mockingbird shirt seen above for my husband. The shirt is so soft and nice quality. My husband loves that book and think that it's a great shirt. It retails for $28 and with that purchase, donates one book to a person in need. "In addition to spreading the joy of reading through our tees and accessories, we acknowledge that many parts of the world don’t have access to books at all. We are working to change that. For each product sold, one book is donated to a community in need through our partner Books For Africa." Check out Out of Print clothing for some great t-shirts and more information about the company. That shirt looks totally awesome, thank you very much for sharing.